Agnes was born at Assisi in 1197, or 1198, the youngest daughter of Ortulana and Favarone di Offreduccio and younger sister of St. Clare. On 18th March, 1212 Clare moved by the preaching and example of St. Francis left her father’s home to follow the way of life taught by the saint. Sixteen days later Agnes who was determined to share Clare’s life of poverty and penance, joined her sister at the monastery of St. Angelo in Panso, where the Benedictine nuns had offered Clare temporary shelter. Needless to say Count Favorino was furious. He sent his brother Monaldo, with several relatives and some armed followers, to St. Angelo to force Agnes, if persuasion failed, to return home. Monaldo, beside himself with rage, drew his sword to strike the young girl, but his arm dropped, withered and useless, by his side. Some of the other men tried to drag Agnes out of the monastery by the hair but her body became so heavy that they were unable to do so. Agnes’s relatives were obliged to withdraw and to allow her to remain with Clare. Soon after this St. Francis established the two sisters at St. Damian’s, the little church he had rebuilt with his own hands. There several noble ladies of Assisi joined Clare and Agnes, and thus began the Order of the Poor Ladies of St. Damians. Agnes was eventually appointed Abbess and she ruled with loving kindness and knew how to make the practice of virtue bright and attractive to the sisters. 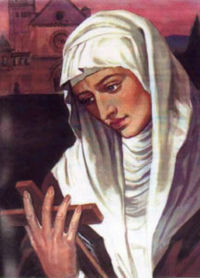 In 1219, Agnes, despite her youth, was chosen by St. Francis to found and govern a community of the poor Ladies at Monticelli, near Florence, which in the course of time became almost as famous as St. Damian’s. Nothing perhaps in Agnes’s character is more striking and attractive than her loving fidelity to Clare’s ideals and her undying loyalty in upholding the latter in her lifelong and arduous struggle for Seraphic Poverty. Full of zeal for the spread of the Order, Agnes established from Monticelli several monasteries of the Poor Ladies in the north of Italy, including those of Mantua, Venice, and Padua, all of which observed the same fidelity to the teaching of Francis and Clare. In 1253 Agnes was summoned to St. Damian’s during the last illness of Clare and assisted at her death and funeral (August). Agnes herself died three months later on the 16th of November and her precious remains repose near the body of her mother and sisters, in the church of St. Clare at Assisi. The feast of St. Agnes is 16th November.